So you really want to try a classic Singaporean hawker dish? Kway chap isn’t for beginners, and will perhaps only suit those brave enough to lust after, say, haggis in the West, but it’s well worth seeking out for its rich soy sauce-based gravy, delectable flat noodles and tender pork offal. Forget newfangled nose-to-tail dining; this is the original real deal, a slurpworthy breakfast that can be topped up with more bowls of kway long after the meaty bits are gone. 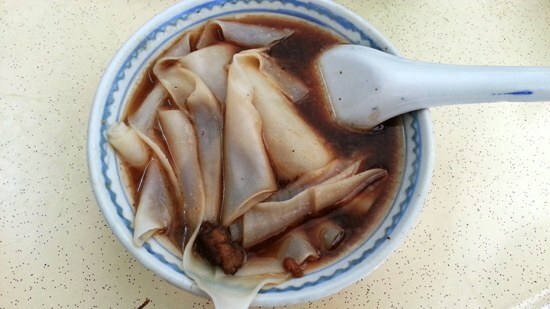 A bowl of kway, or flat rice noodles, in a soy-based gravy. Like many hawker dishes in Singapore, kway chap is of Teochew Chinese origins. Kway refers to the thick, broad sheets of rice noodles, which come served in a bowl with the offal, while chap means soup or gravy. The key pork parts used are the skin and intestines, which must be carefully cleaned — this is why kway chap stalls are well-staffed by workers who start this process in the wee hours of the morning, earlier than most other stalls. After the organs are cleaned, they are braised in a thick gravy made from dark soy sauce, meat stock and a variety of aromatic Chinese herbs. Really, it tastes better than it looks! Kway chap is not as easily found as other Singapore dishes due to the massive amount of preparation needed; look for a larger stall manned by at least three people, with trays of brown, braised offal laid out for diners to choose from. While the offal is the most coveted ingredient, and the most expensive, the offal-offended need not fret. Kway chap stalls often put the braising gravy to good use by including hard-boiled eggs, firm soya bean curd, pork belly and boiled peanuts. Sides of salted mustard greens, fishcake and beancurd skin are usually also available, while some stalls include the addition of other things like ears, blood and duck. Indeed, some braised duck stalls serve kway chap as a secondary dish. Expect to pay around S$4-$5 per person, but you’ll get a very small selection of ingredients as an individual customer, so it’s best to go in a group and share. Blanco Court Food Centre: Old Airport Road Food Centre, #01-127; Tues-Sun, 11:30-03:30. Garden Street Kway Chap: Serangoon Garden Market and Food Centre, #01-21, Tues-Sun, 08:00-15:00. 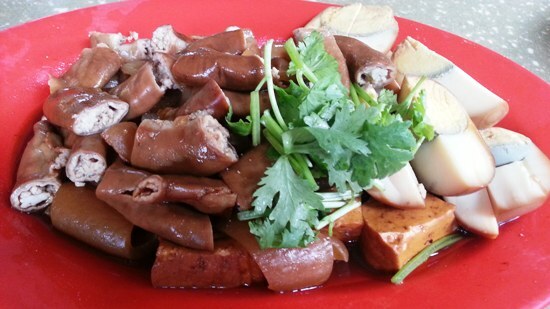 Guang Liang Cooked Food: Blk 630, Bedok Reservoir Road Food Centre, #01-35, Tues-Sun, 05:30-12:30.